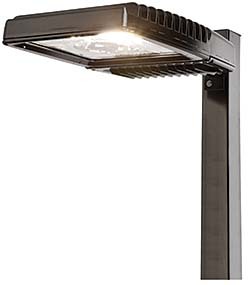 Evolve LED scalable area lights are designed as retrofit for outdoor spaces originally optimized only for HID. Lights use reflective — not refractive — technology to minimize glare and spill light, and are rated for 50,000 hours of life. Housing is die-cast aluminum. Design incorporates a heat sink light engine directly into the unit to improve heat transfer.